While there are many bad consumers in the world, there are also those out there who recognize they haven’t done the right thing, and seek to make amends, even if it’s years later. 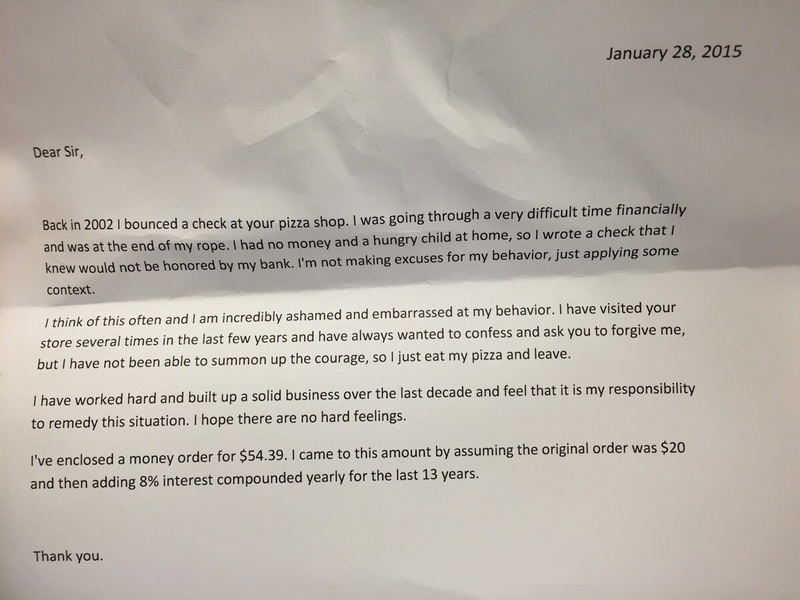 That’s how it went down for a pizza shop owner who was surprised to find a letter in the mail from a customer who’d written a bad check in 2002 — and enclosed a money order to make up for it. Reddit user morgan_freemun (we see what you did there!) posted the letter detailing the customer’s desperate situation, in which he or she admits to knowingly writing a check for $20 that the bank wouldn’t honor. “Received this today. I’m speechless,” the redditor writes with the image of the letter dated Jan. 28, 2015 (it took a few days to get through the mail, the poster adds). The customer adds that they think about the situation a lot, and still feels ashamed and embarrassed for writing that check. Even though they’ve visited the store several times in the past few years, they write that they couldn’t summon up the courage to confess and ask for forgiveness until now. “I have worked hard and built up a solid business over the last decade and feel that it is my responsibility to remedy this situation. I hope there are no hard feelings,” they write, enclosing a money order for $54. “I came to this amount by assuming the original order was $20 and then adding 8% interest compounded yearly for the last 13 years,” they explain. The pizza shop owner writes that he assumed at first the letter writer was a guy, but admits it could just as easily be a woman. Either way, he appreciates the effort.